Last month Trim Tabs estimated December payroll growth was 38,000. ADP estimated payroll growth at 325,000. I estimated +78,000. Was this a miss by Trim Tabs? ADP? Me? Here is the correct answer, whether or not you believe the BLS: I don't know and no one else does either. The BLS numbers are subject to massive revisions. Literally millions of jobs are revised away (or added) months, even years later. December and January are typically the hardest months to estimate, subject to huge seasonal adjustments and later revisions. Economic turning points compound the problem greatly. 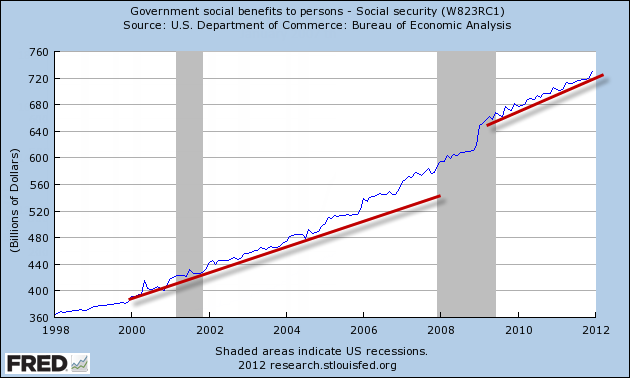 The BLS readily admits its birth-death adjustments are hugely wrong at turning points. Are we at an economic turning point now? I think so, and a turn in supporting data is all I need to convince me. If so, the BLS can be off on its numbers by a great deal. The following weekly macro analysis and forecast (via email) is from Madeline Schnapp, Director, Macroeconomic Research, Trim Tabs. The above title is mine. Jobs: Based on our analysis of real-time income tax withholdings, we estimate that the U.S. economy added only 45,000 jobs in January, little changed from 38,000 in December. Wages: While the BEA reports that wages and salaries increased 3.8% in December, TrimTabs real-time analysis shows that wages and salaries rose only 2.9%. When TrimTabs data is used to replace the BEA wage and salary estimates, disposable income falls by $45 billion and the savings rate declines from 4.0% to 3.6%. 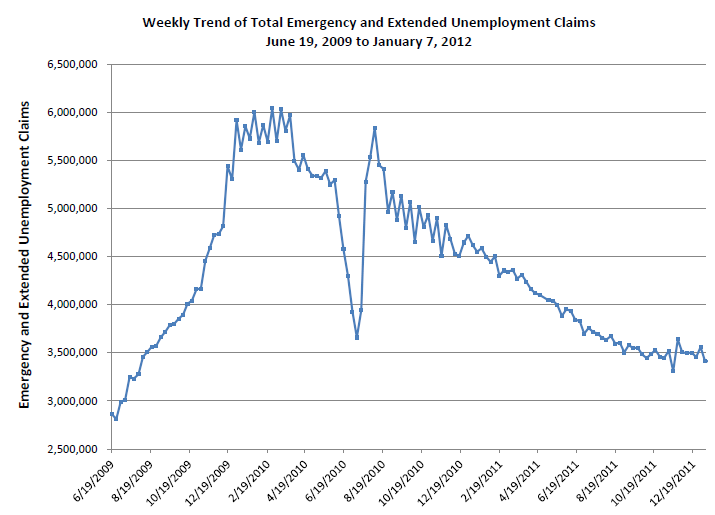 Unemployment Benefits: Expiring emergency and extended unemployment insurance benefits will likely leave Americans with as much as $25 to $50 billion less cash in 2012. Bonuses: Wage and salary growth net of inflation weakened to -2.1% y-o-y in January from -0.5% y-o-y in December. While much of the January decline is due to lower bonuses this season relative to last, wage growth is still considerably weaker than it was in December. Weekly Claims: Weekly initial unemployment insurance claims jumped 21,000 in the latest reporting week, coincident with the decline in seasonal adjustment factors. Last week’s increase suggest recent declines were likely due to seasonal adjustments rather than a significant improvement in the labor market. GDP: Last week’s preliminary Q4 2011 GDP growth estimate of 2.8% was probably overstated. The price deflator for Q4 2011 was just 0.39%, down from 2.56% in Q3 2011. Also, two-thirds of growth in Q4 2011 was due to a swing in inventories from -1.35% in Q3 2011 to +1.94% in Q4 2011, which is likely to be reversed in Q1 2012. We believe the slowdown in GDP growth from 3.03% in 2010 to 1.72% in 2011 provides a better sense of the trend. Housing: The housing market is likely to remain weak despite near record low mortgage rates because 23.4 million Americans are unemployed or underemployed, 10.1 million mortgage borrowers are underwater, and 6.2 million mortgage borrowers are delinquent. Synopsis: We see nothing on the horizon to knock the economy out of its slow growth mode. The economy faces substantial headwinds from negative real wage and salary growth, high unemployment, waning government support, expiring tax incentives, contracting state and local governments, elevated fuel prices, and a sluggish housing market. The economy is highly vulnerable to economic shocks from overseas. Workers in the U.S. are faring much worse than U.S. government statistics indicate. The personal income report released Monday by the Bureau of Economic Analysis (BEA) reported that wages and salaries rose 3.8% y-o-y in December, while our analysis based on withholdings indicates that wages and salaries rose only 2.9% y-o-y. We believe the BEA is missing the slowdown in wages and salaries because it relies on lagged data to compute current trends. The BEA derives its results from the Quarterly Census of Employment and Wages (QCEW) which it receives a quarter in arrears. The BEA’s wage and salary data for December is derived from QCEW data from Q2 2011, when the economy was picking up steam in response to massive monetary stimulus. To compute current wages and salaries, the BEA interpolates and extrapolates the lagged QCEW data forward, using inputs from the BLS to make necessary adjustments. Unfortunately, this methodology misses rapid changes in wages and salaries that occur when the economy moves from expansion to contraction or vice versa. The BEA is overstating employment growth due to distortions caused by huge seasonal adjustments to the BLS employment data. The BEA will probably continue to overstate wages and salaries, personal income, and the savings rate for the period from October through December until April 2012, when QCEW data from Q4 2011 will be available. Here are two of the many charts from the report. Trim Tabs writes ... "At its peak in February 2010, the federal government’s emergency and extended unemployment benefits programs provided assistance to 6.0 million people. Since then, the number of people receiving benefits has steadily declined, and they totaled only 3.4 million as of the week ended January 6. Since only 2.2 million jobs have been created since the recession started in December 2007—fewer than the number of people no longer receiving benefits—it is likely that 1.0 million or more people now lack both benefits and jobs." I think it is much worse than that. Technically it could be as high as 3.5 million (assuming no one with expiring benefits ever found a job). It would only be a million or so, if all of them did. Neither of those extremes is likely so I will make a rough guess that 2 million lost benefits and still have no job. However, many of those with expiring benefits likely took what I call "forced retirement". They wanted a job, needed a job, yet had no job and no prospects of a job. To survive, those of sufficient age retired involuntarily to collect social security benefits. 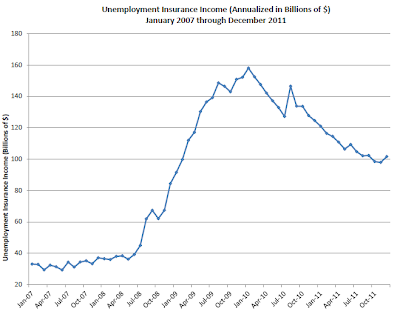 Trim Tabs writes "According to the BEA, the loss of income from extended and emergency unemployment insurance benefits has amounted to $57 billion since January 2010. In the past twelve months, the loss of income amounted to $23 billion, which is equal to about 13.4% of the estimated $188 billion increase in wages and salaries in 2011. 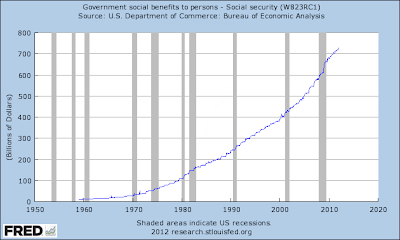 In 2012, we estimate that expiring benefits will reduce incomes by approximately $25 to $50 billion.". 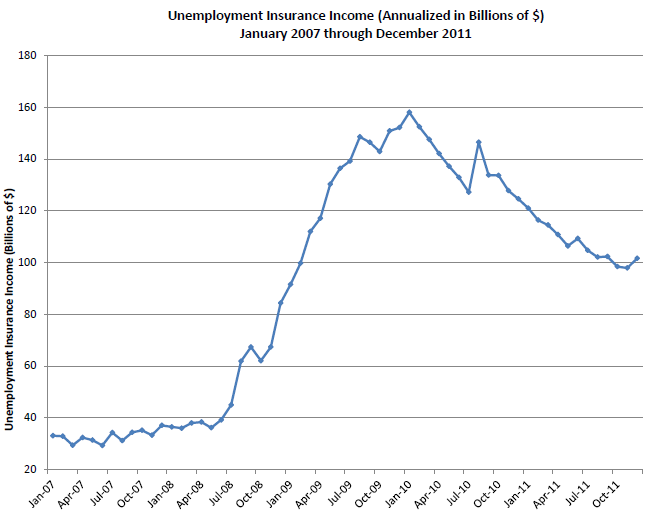 It's safe to assume the loss of income is substantial, and it's about to get "more substantial". However, one does need to factor in involuntary retirement and subsequent social security payments. That's quite a jump. Boomer demographics is clearly at play. But how much is "involuntary retirement"? 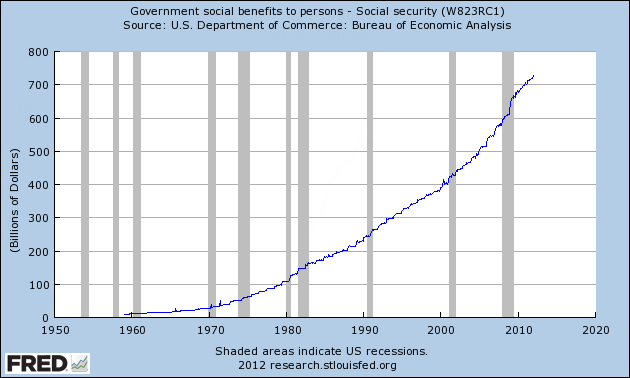 Regardless, one thing is certain: That exponential trend is not remotely sustainable. 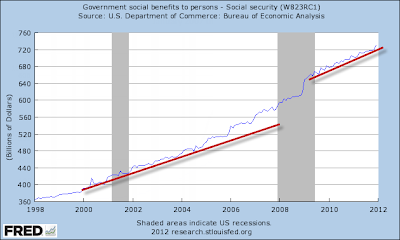 One final point about social security: Retirement income does not match employment income. The presumption is "it doesn't have to". Just how valid is that presumption? Even if it is valid, how many have sufficient savings to retire with the same lifestyle? For someone with a mortgage and underwater on their house with rising food and energy costs, the presumption is not likely to be correct and/or savings are not likely to be sufficient. The obvious result is a "forced lifestyle change" and less spending. This boomer drag on GDP trends is enormous, yet few see it. Moreover, interests rates of 0% on CDs does not help any. Those on fixed income have been clobbered by Fed policies. I have talked about this numerous times but here is a quick recap of a pair of recent articles. Recent earnings reports have contained numerous misses, economic data has been generally weak in the US and very weak in Europe, and the Fed did not pledge to hold interest rates to zero through the end of 2014 for no reason. Recession rationale is stacked up, we just need coincident indicators to confirm.